Former Portuguese Prime Minister António Guterres, has been sworn in as Secretary General of the United Nations during an inauguration ceremony at the organisation’s Headquarters in New York. He was appointed to the post in October. In his speech Guterres said that he aimed to inspire people to move from fear to trust of one another. He wanted to help forge a world shaped by the values of the UN charter. António Guterres said that the UN risked being overtaken by the global challenges it faced and needed to change. He set out radical plans to simplify and decentralize the organisation, and to make it more flexible. Women remained a significant priority, the UN having previously failed to meet its target for complete gender parity by the year 2000. Guterres said that he planned to have met the target amongst his own appointments by the end of his term of office. Current Secretary General Ban Ki-moon, who has been in post for ten years, received tributes from the Assembly. In particular he was praised for the progress made under his leadership towards the 2030 Sustainable Development Agenda and the Paris Agreement on Climate Change. His contributions to feminism, and to multilingualism at the UN, were also brought to the fore. 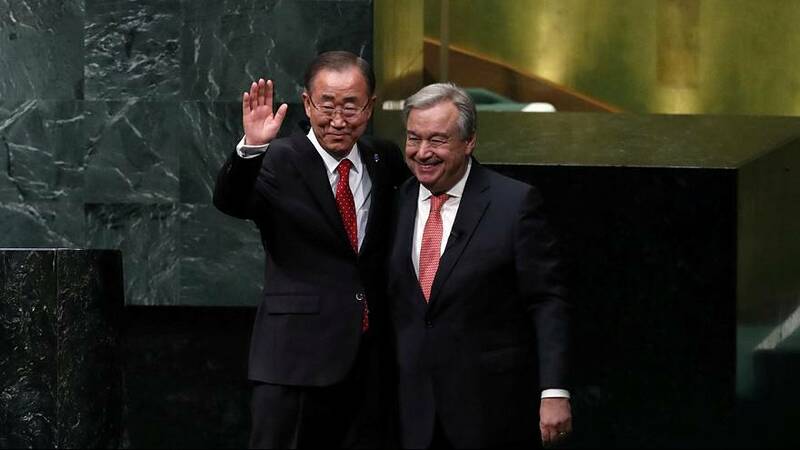 Ban Ki-moon will hand over his role to Guterres on 1 January.